Grenades first began being used in the 16th century. Originally they were hollow iron balls filled with gunpowder and ignited by a slow burning match. To be effective, soldiers had to be able to throw them over 100 feet and the tall, strong soldiers selected for this task became known as grenadiers. In the opening months of the First World War the British Army used Grenade No 1. This was a cast-iron canister on an 18 inch stick. Soldiers soon discovered that they were dangerous to use when in a front-line trench. 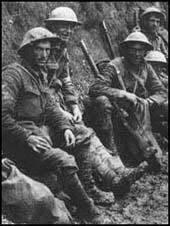 There were several cases of soldiers being killed when the grenade hit the front of the trench. The German stick grenade had a wooden handle about ten inches long that carried a metal canister at his head. The head unscrewed to allow the detonator to be inserted. The screw cap at the end covered a string which was pulled to ignite the fuse inside the head. Several people became involved in producing a grenade that was safe to use but created the maximum damage to the enemy. By 1915 the Mills Bomb was the most popular grenade used by British troops. The bomb had a central spring-loaded firing-pin and and spring-loaded lever locked by a pin. Once the grenade was in the air, the lever flew up and released the striker, which ignited a four-second time fuse, allowing the thrower to take cover before it exploded. When the grenade went off the cast-iron casing shattered producing a shower of metal fragments. During the next three years more than 33 million Mills Bombs were issued to soldiers in the British Army. It was also modified so that it could be fired by a rifle. Martin Hale, an English engineer, developed a cylindrical iron grenade mounted upon a thin steel rod and fitted with a simple impact fuse. The rifle was loaded with a blank cartridge and the grenade rod inserted into the barrel. On firing, the gas released from the cartridge, could send the grenade over 600 feet. 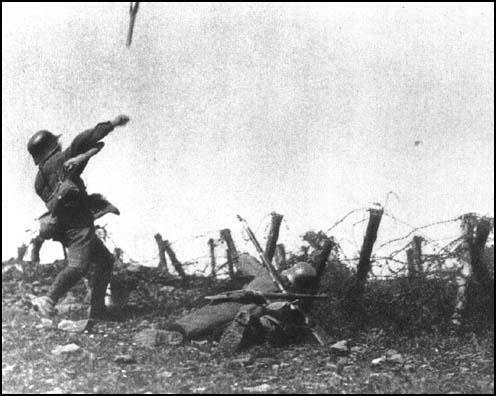 A German soldier throws a stick grenade during an attack on Allied trenches in 1918. He carries no other weapon and is protected by a rifleman who carries extra grenades. The best bomb to use in a bombing attack is the Mills. It is the only bomb that can be retained in the bomber's hand until he has the opportunity to throw with advantage. All bombers must be supplied with a left-handed glove or finger stall. We discovered that the men's fingers got absolutely raw from pinching in the split pin and drawing out the ring from the Mills bomb. It would be a great improvement if the Mills bomb could be supplied with a larger ring and better device than the present split pin. The casualties among the bombers are necessarily very great. It is absolutely essential that every Officer, NCO and man in the ranks should be instructed in how to throw a Mills Bomb. (2) On 29th September, 1915, during the Battle of Loos, Second Lieutenant Arthur Fleming-Sandes won the Victoria Cross for attacking the German front-line with grenades. His action was described in the VC citation. On 29th September 1915 at the Hohenzollern Redoubt, France, Second Lieutenant Fleming-Sandes was sent to command a company which was in a very critical position. His men, very much shaken by continual bombing and machine-gun fire, were beginning to retire, but the second lieutenant collected a few bombs and jumping on the parapet in full view of the Germans, only 20 yards away, threw them. Although severely wounded almost at once, he continued to advance and throw bombs until he was again wounded. This act put new heart into his men and saved the situation. Sandes winning his VC at the Battle of Loos.